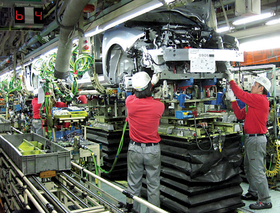 Workers at Nissan's Oppama plant install an electric motor and inverter on a Leaf. OPPAMA, Japan -- The contrast between the Leaf electric vehicle rolling down Nissan’s assembly line here and the gasoline-powered Jukes, Cubes and Notes coming off the same line is striking. At work stations where the gasoline cars are fitted with fuel tanks, the Leaf gets a battery pack. Where the others get an engine, the Leaf receives an electric motor and inverter. The complexity of adding the Leaf’s electric powertrain to the traditional manufacturing mix is a big reason Nissan was slow to ramp up the Leaf’s output -- and quick to irk impatient customers who want their Leaf now. Nissan has booked 20,000 Leaf orders in the United States, 6,000 in Japan and 1,300 in Europe. But since it went on sale last month, Nissan has delivered only 53 units to customers in the United States, 330 units in Japan and a mere 10 to Europe, including one to the prime minister in Portugal, where Nissan will start producing batteries for the Leaf in 2012. Nissan plans to boost output from 2,000 units a month in January to a full-production pace of 4,000 units in March. That will meet Nissan’s target of producing 10,000 units in the fiscal year ending March 31, Sakai said. Overtime and holiday shifts may help it get there. The 6,000 orders from Japan are expected to be filled by the end of March. But many customers in the United States and Europe will still have to wait longer. Until Leaf assembly lines are added in Sunderland, England, in 2012 and Smyrna, Tenn., in 2013, the bottleneck of supply will be here at Oppama, the only plant making the zero-emissions hatchback. Production of the Leaf started out slow and cautious, to nip any potential glitch before it reaches the customer. The Oppama plant, just south of Tokyo, currently is producing about 120 Leafs a day, about half its full capacity. During a Jan. 25 media tour of the factory, which has capacity for 430,000 vehicles annually, just one in seven cars coming down the line was a curvy-backed Leaf. Among the Leaf-specific systems that demand extra testing: the electric powertrain, battery pack, revamped heating and air conditioning system and onboard telematics system. By summer Nissan will have achieved the volume needed to deliver the 20,000 units ordered by U.S. customers, said Ichiro Miura, who manages Leaf production at Oppama. Of the 10,000 Leafs being manufactured in the fiscal year ending March 31, about 6,000 are expected to go to Japan with the remainder divided between North America and Europe. That means the bulk of U.S. orders will be filled in the fiscal year starting April 1. During that period, Oppama will operate at an annual capacity of 50,000 units. But how to divvy up that output is still an open question. Filling the current U.S. order for 20,000 vehicles will eat up part of that production. After that, Nissan is noncommittal.